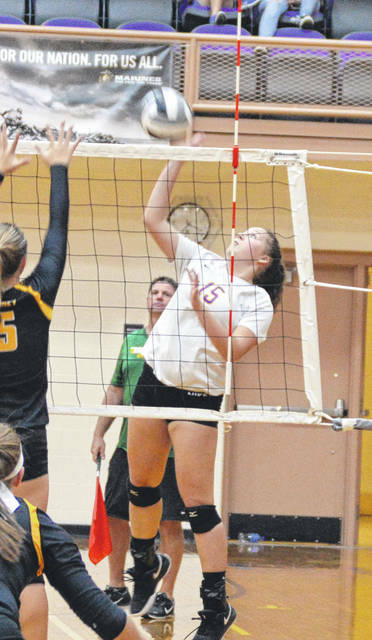 Alyssa Burley goes for a kill during Butler’s match versus Sidney on Tuesday. Grace Swarts (2) and Grace Marshall (10) go up for a block during Butler’s match versus Sidney on Tuesday. 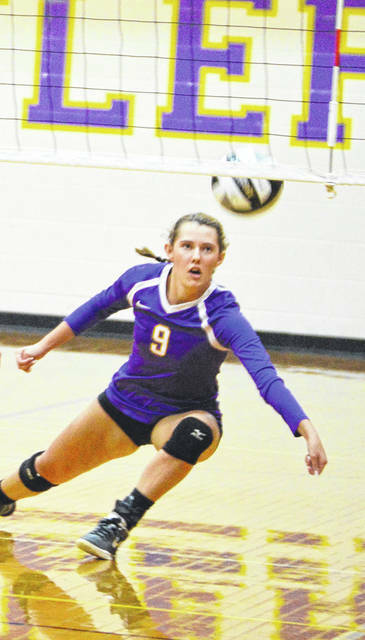 Grace Swarts records one of her 47 assists during Butler’s match versus Sidney on Tuesday. Karli Kercher goes to save the ball during Butler’s match versus Sidney on Tuesday. 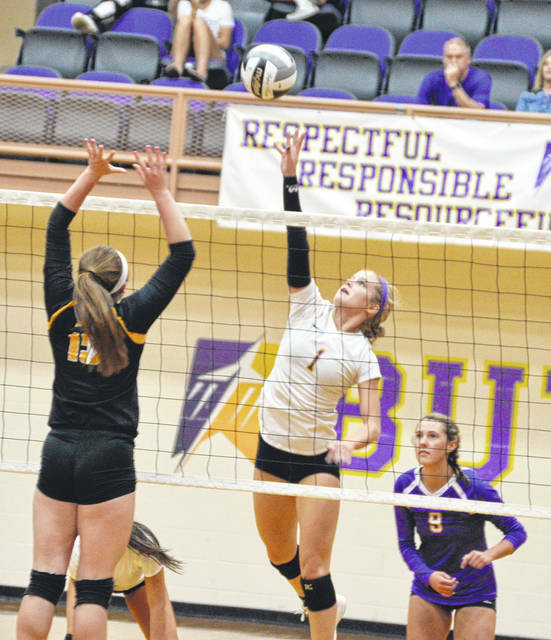 Grace Marshall goes for a kill during Butler’s match versus Sidney on Tuesday. 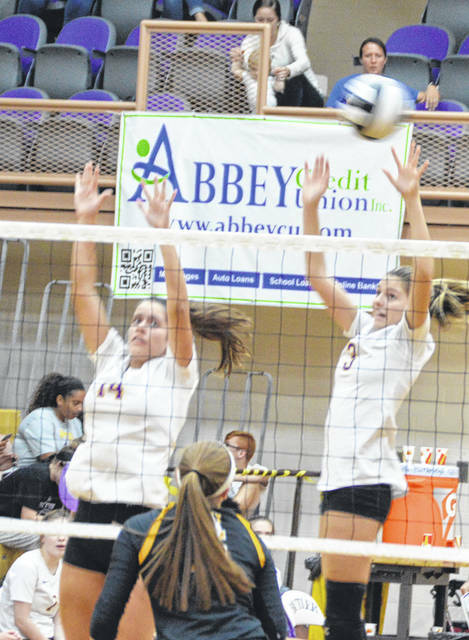 Abby Plsek (14) and Olivia Follick (3) go up for a block during Butler’s match versus Sidney on Tuesday. Taryn Butler hits a shot during Butler’s match versus Sidney on Tuesday. 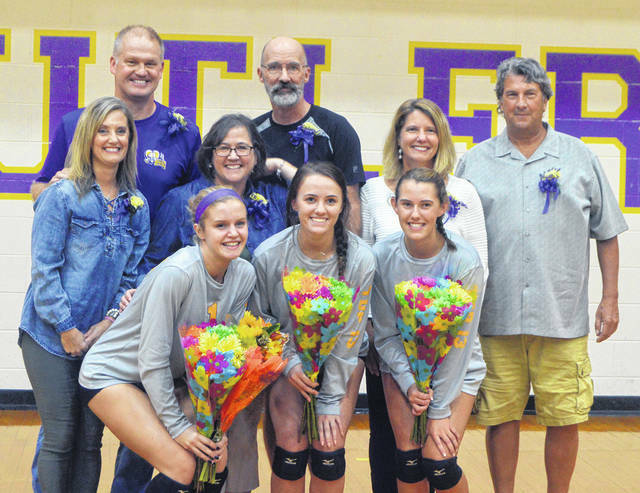 Butler senior Alyssa Burley was honored prior to Butler’s match versus Sidney on Tuesday. 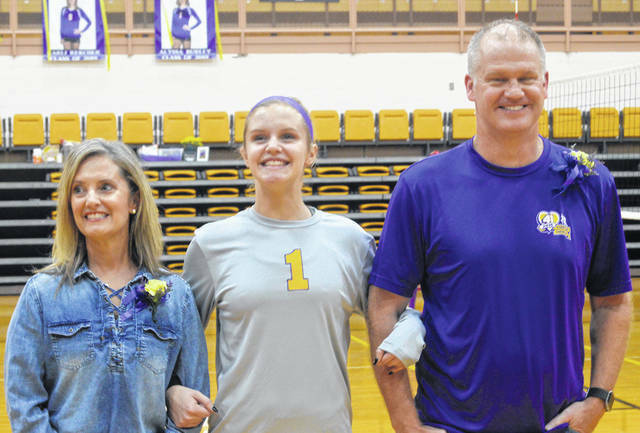 Butler senior Karli Kercher was honored prior to Butler’s match versus Sidney on Tuesday. 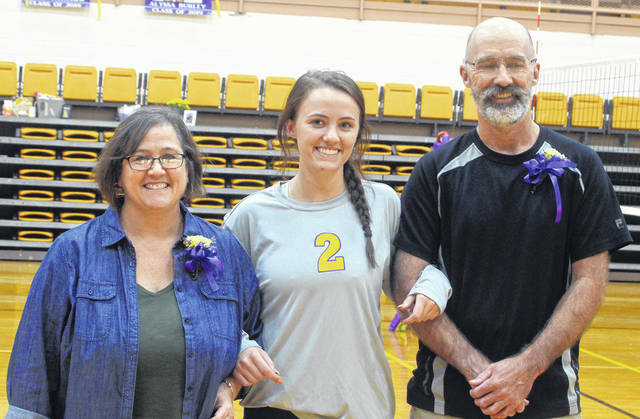 Butler senior Grace Swarts was honored prior to Butler’s match versus Sidney on Tuesday. Butler seniors, left to right, Alyssa Burley, Grace Swarts, and Karli Kercher were honored prior to Butler’s match versus Sidney on Tuesday. 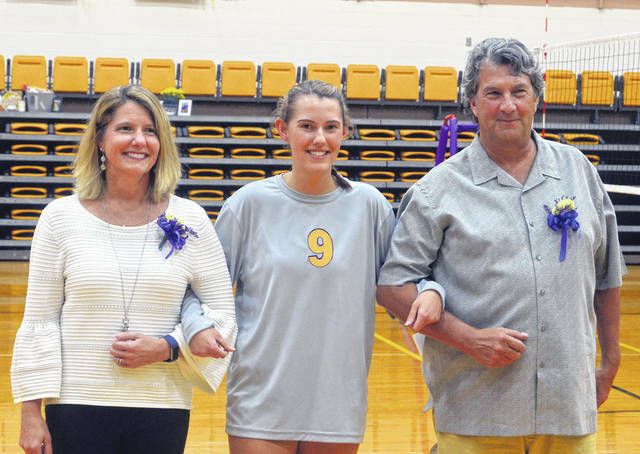 VANDALIA — The Butler volleyball team honored three seniors on Tuesday evening when they hosted Sidney in a Greater Western Ohio Conference north division match-up. Unfortunately, the Aviators fell in a tense five-set match 25-22, 22-25, 33-31, 23-25, 16-14. Butler fell to 12-8 overall and 10-4 in league play while the Jackets approved to 14-7 overall and 9-5 in conference play. Prior to the match, the Aviators honored seniors Alyssa Burley, Karli Kercher, and Grace Swarts. Burley led the Aviators with 20 kills followed by Taryn Butler with 18 and Olivia Follick with 9. Kercher had three serving aces followed by Swarts with two. Swarts also had 47 assists in the match with Kercher (12) and Burley (11) leading in digs. Head coach Sean McMorrow praised the senior class. The 2019 Senior Class for the Butler Aviators includes three fantastic young women. We have Alyssa Burley, Karli Kerchner and Grace Swarts. TIPP CITY — On Thursday, the Aviators traveled to Tipp City to battle their northern neighbor and fell to the the Red Devils in three sets 25-16, 25-16, 25-18. The win means Tipp has earned at least a share of the Greater Western Ohio Conference North title after ending the regular season 20-2 overall and 14-1 in league play. Troy entered Saturday with a chance to tie the Devils atop the standings with a win over Piqua. Butler fell to 12-9 overall and slipped into a tie for third place in the division with Sidney at 10-5. A high point of the match was when Burley broke the school record for Most Kills in a single season that was previously held by Zoie Franklin. That’s the second school record broken this season. Earlier in the year, Grace Swarts broke the school record for Most Assists in a Career. She broke a record previously held by Austen Thomas. Butler traveled to Miamisburg on Saturday evening in a contest that ended too late for this edition. The Aviators will open Sectional play on Tuesday, Oct. 16 when they host Fairmont (8-14) at 6 p.m. in the Butler Student Activities Center. https://www.vandaliadrummernews.com/wp-content/uploads/sites/19/2018/10/web1_1-9-1.jpgAlyssa Burley goes for a kill during Butler’s match versus Sidney on Tuesday. https://www.vandaliadrummernews.com/wp-content/uploads/sites/19/2018/10/web1_2-10-1.jpgGrace Swarts (2) and Grace Marshall (10) go up for a block during Butler’s match versus Sidney on Tuesday. https://www.vandaliadrummernews.com/wp-content/uploads/sites/19/2018/10/web1_2-1.jpgGrace Swarts records one of her 47 assists during Butler’s match versus Sidney on Tuesday. 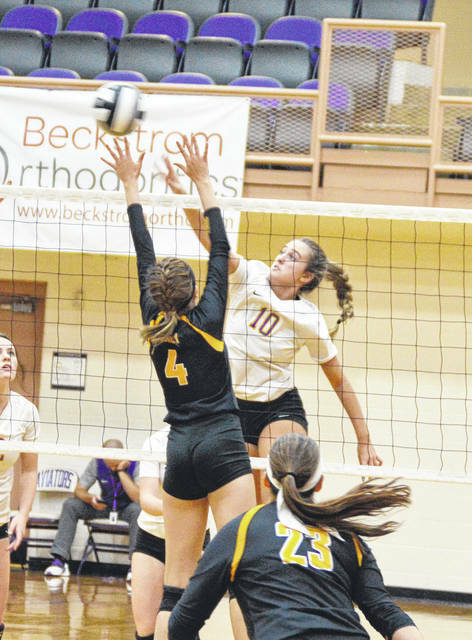 https://www.vandaliadrummernews.com/wp-content/uploads/sites/19/2018/10/web1_9-1.jpgKarli Kercher goes to save the ball during Butler’s match versus Sidney on Tuesday. https://www.vandaliadrummernews.com/wp-content/uploads/sites/19/2018/10/web1_10-2.jpgGrace Marshall goes for a kill during Butler’s match versus Sidney on Tuesday. 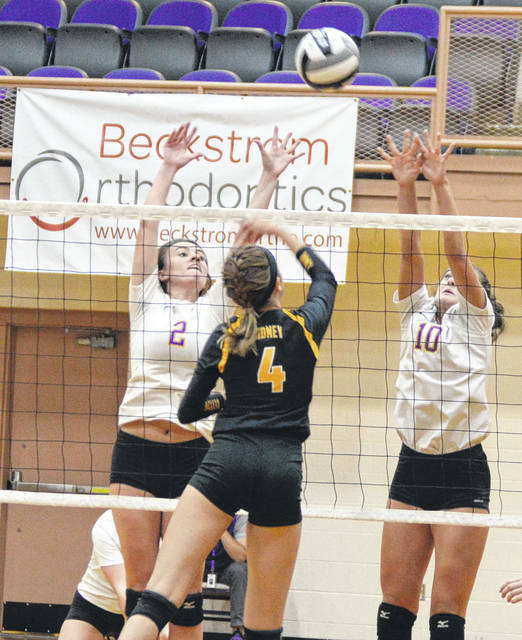 https://www.vandaliadrummernews.com/wp-content/uploads/sites/19/2018/10/web1_14-3-1.jpgAbby Plsek (14) and Olivia Follick (3) go up for a block during Butler’s match versus Sidney on Tuesday. https://www.vandaliadrummernews.com/wp-content/uploads/sites/19/2018/10/web1_15-2.jpgTaryn Butler hits a shot during Butler’s match versus Sidney on Tuesday. https://www.vandaliadrummernews.com/wp-content/uploads/sites/19/2018/10/web1_Burley-2.jpgButler senior Alyssa Burley was honored prior to Butler’s match versus Sidney on Tuesday. https://www.vandaliadrummernews.com/wp-content/uploads/sites/19/2018/10/web1_Kercher-2.jpgButler senior Karli Kercher was honored prior to Butler’s match versus Sidney on Tuesday. https://www.vandaliadrummernews.com/wp-content/uploads/sites/19/2018/10/web1_Swarts-2.jpgButler senior Grace Swarts was honored prior to Butler’s match versus Sidney on Tuesday. https://www.vandaliadrummernews.com/wp-content/uploads/sites/19/2018/10/web1_Seniors-1.jpgButler seniors, left to right, Alyssa Burley, Grace Swarts, and Karli Kercher were honored prior to Butler’s match versus Sidney on Tuesday.